On Friday, December 16th V:.W:. Richard R. Moysey, Shekomeko Lodge #458 and R:.W:. 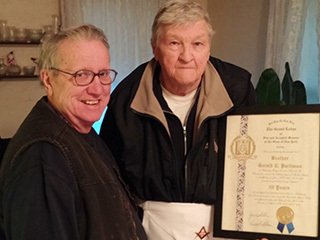 Arthur H Pritchard, District Deputy Dutchess District visited B. Gerald C. Parliman in his home to present him with an apron, pin, and certification document in honor of his 50 years of Masonic service. On December 14th, Hendrick Hudson Lodge #875 held a Brother-Bring-A-Friend event in conjunction with the Dutchess Masonic District. Approximately 50 Brothers, Prospects and Friends attended the event. After a short business meeting, participates enjoyed light refreshments, courtesy of W:. Roberto Reis’s wife and friends and were welcome to chat with representatives of the Concordant Bodies, including the Rainbow Girls, Eastern Star, York Rite, Scottish Rite, and the Grotto. At the open meeting following light refreshments formal presentations were made by lodge members, the District Deputy, and the Camp Turk Committee. Dutchess District Lodges were represented including Hendrick Hudson #875, Triune-Obed #782, Rhinebeck #432, Wappingers #671, Shekomeko #458, and Warren #32. Each year in October, Dutchess District Masons, their wives, family members and friends travel to the Masonic Care Community (MMC) in Utica, NY to distribute Christmas presents to the 400 residents at the facilities. The trip is preceded by a “wrapping” event, held at Hendrick Hudson Lodge #875 , located in Red Hook, NY, usually held on the weekend prior to the trip. In 2016, the Dutchess District visit was held on Saturday, October 15th. Approximately 40 participants included Masons, their family members, and friends. Most boarded a bus financed by the Masonic Care Community for the 2.5 hour trip to Utica. 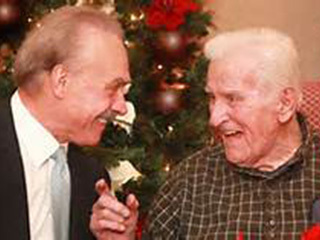 While there, they were treated to a guided tour of the campus, including a walk through Acadia Village, the independent living facility for Masons and their wives. Dutchess District visitors were also treated to lunch and a presentation of the work and activities carried out at the MCC. Prior to the visit, Masons, and family members met and wrapped 400 gifts, include tote bags, calendars, and teddy bears for the MCC residents. The visit extended from 7:30 am to 6:30 pm. Each year during the third week in September, Orvis Sandona, located in Millbrook, NY holds a Game Fair, which attracts more than 4,000 participants. The event includes demonstrations, shooting contests, and the opportunity to visit with more than 80 vendors as they share their wares. 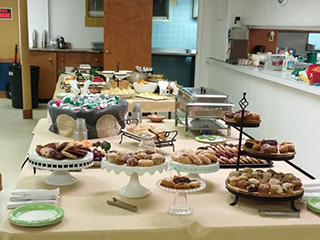 In 2016, Dutchess District Masons offered a coffee service for vendors and other attendees. 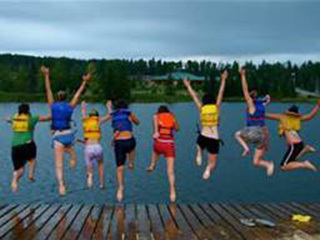 Their efforts netted more than $600, which will support the 2016 District Deputy Project – Sending Dutchess County Youths to Camp Turk, the Masonic camp for children located in the southern Adirondacks.